We offer a wide range of pads, rolls, socks, mats and rugs designed to prevent slips, quickly absorb moisture, and contain and soak up spills. Strong and effective, our lite sorbents are affordable and come in a number of materials for a variety of industrial applications, including hazardous material spills, caustic fluid containment, and static-dissipative needs. We also carry professional spill kits, containment products, and drain covers. We can order the full line of lite sorbents from our partners, Meltblown Technologies. Gray universal absorbent pads and rolls absorb oil, water, glycols, gasoline, diesel, hydraulic fluids and most chemicals. Fine fiber meltblown polypropylene sorbents have a soft, super-absorbent fiber that resembles tissue paper. We thermally bond a thin layer to each side of our standard, coarse-fiber, meltblown polypropylene. These composites absorb quickly, remove the sheen, and grip cement floors. GFMF is our most popular universal sorbent. 40 - 3” x 4’, Durable, universal, polypropylene socks per package. Use one sock to cover all your needs! Absorbs oils, coolants, solvents, and water. Absorbs 30 gallons per package. Includes a variety of sorbents to handle smaller spills of oils, coolants, solvents or water that truckers encounter on a regular basis; pre-packed in a handy bag. Small size easily fits behind the seat of a truck. 3-ply construction makes it stronger, more durable and reduces lint. Gray color masks drips and spills, dimpled and perforated so you can take only what you need and reduce waste, medium weight pad. 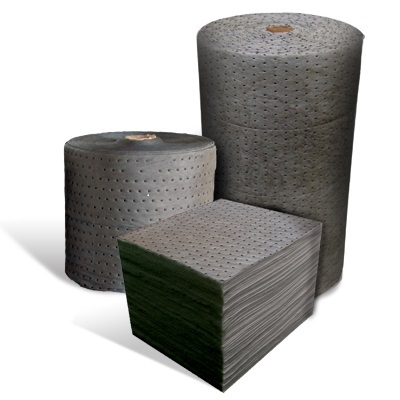 3-ply construction; double-sided, low-linting coverstock and meltblown core; heavy weight perforated pads. Premium extra-tough universal sorbent perfect for wipe down applications. The Economical ENV* boom features interconnectivity, and a lint-free blue sleeve with a 5" or 8" diameter. For use with oil and petroleum based fluids. Hydrophobic nature makes it ideal for outdoor applications. Heavier bonded to enhance strength and reduce linting. 1-ply, dimpled, perforated, medium weight pads. Now available in Heavy (SPC100) & Light (SPC200) weights! MAXX Enhanced ENV* is an oil only sorbent that's equally as effective on land as on water. Repels water and floats indefinitely even when saturated. 1-ply, white, economy, heavy weight pad.